Stix Brands SoapStix Lavender Travel Spray gently cleans and rinses easily leaving skin smooth, refreshed and moisturized. Made with all natural ingredients this beautiful hand soap is specially formulated for people with sensitive skin who suffer from dry skin and eczema. Avoid using harsh chemical based public soap dispensers and detergent soaps. 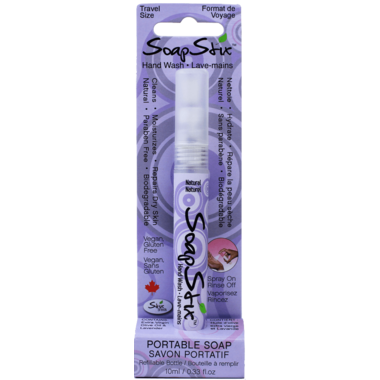 Now you can wash hands with confidence anywhere with your own travel size SoapStix spray. Directions: Spray onto hands, rub together and then rinse in clean water. I'm a nurse so I'm constantly washing my hands at work. Love that this is a pocket sized option without all of the chemicals in it of regular soap. An awesome product and a great Canadian company that I feel good about supporting. I didnâ€™t realize how much I was going to come to enjoy using SoapStix, but now I hate to be caught without mine! A fantastic and convenient way to avoid the harsh, chemical-laden, skin-drying soaps in public washrooms. Extremely handy and works well. Definitely preferable to the soaps available at public restrooms! Although the smell of the essential oils is quite strong, this is great soap! It leaves your hands feeling very soft. I take it with me wherever I go! This is a very useful product for use when you are away from home. For us, we use this at work, out with the kids....it is great as we don't have to use chemical-laden foaming soap and our hands are very soft. We can control the soap that we use and we can say "NO" to pink soap. As a mom, I am very pleased with this product as I was looking for something like this for quite awhile.